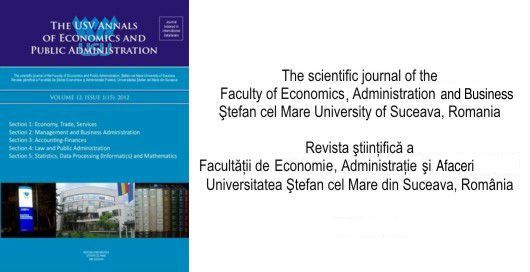 The USV Annals of Economics and Public Administration (ISSN 2285-3332, On-line ISSN 2344-3847, ISSN-L 2285-3332) appeared until 2011, inclusively, under the name of The Annals of the Stefan cel Mare University of Suceava, Fascicle of the Faculty of Economics and Public Administration (with ISSN 2066-575X). It appeared for the first time in 2001, when the Faculty of Economics and Public Administration organized the first symposium; after that, the symposium had a periodical oranization and the journal appeared periodically, too. Understanding the necessity of improving the quality standards of the scientific research in the frame of the Faculty of Economics and Public Administration, as well as for adapting at the CNCSIS (The National Council of Scientific Research in Higher Education) requirements, we proceeded for the reorganization of the editing procedure of the journal. We managed to classify our journal, which starting with 2008, is in the B+ category of CNCSIS (code 825), remaining in this national classification until 2011, when it was cancelled. It is also indexed in several international databases, such as RePEc, DOAJ, EBSCO, Cabell’s Directories, ERIH PLUS. In the same time, we have increased its visibility in Romania and abroad by developing collaborations with researchers from several universities and institutes. They will be evaluated in blind review system. Starting with 2009, the journal appears twice a year (June and December). The content of Issue 2/2017 can be seen here . The content of issue 2/2016 can be seen here .